Nic Stuart: The Campaign Begins . . . Who's Winning? After three years, the Phoney War is finally over. This piece for the Canberra Times outlines my thinking as the starter's gun explodes . . .
It’s taken some time but we’re finally there. The campaign’s begun. In five weeks time most of Australia will be off to the polling booths. So who’ll win? This article’s just based on informed analysis (speculation) but, as they say in maths, it’s important to show your working. I think mine is pretty robust. If you disagree and think Kevin Rudd will triumph, that’s fine. But I’d like to see your reasoning. The first point is a huge number of voters still haven’t made up their mind who they’ll plump for. They don’t pay much attention to politics. Many will wake on September 7 still slightly unsure where they’ll put a “1”. Suddenly prompted by an image or message that’s resonated, they’ll go for one side or the other. But although they might (or could theoretically) switch, unless something pretty significant happens over the next five weeks it seems unlikely they will. And we’ve already got a pretty good idea of where their votes might flow, because they’re not happy. Start by examining the big published polls. Since Kevin Rudd returned both Nielsen and Newspoll have shown Labor getting 50 percent of the vote. That is, however, the high water mark. The overall consensus shows a government struggling, unable to reach the halfway mark. The problem is that even this won’t be enough. Rudd starts from behind. He’ll need to win the two seats currently held by independents (and the seat of Dobell, formerly occupied by the disgraced Craig Thompson) simply to stay in the game. Examine the state-by-state breakdown and the scale of the problem is evident. Labor needs to win 52 percent of the vote in NSW before it can win three seats to replace these losses. That appears highly unlikely. So where could the gains come from? One seat might, possibly, change hands in WA, but the government’s not popular in that state so it’s unlikely. Polling in South Australia is diabolical for Labor. Although a massive swing’s needed to put seats at risk, that’s a probability because the party’s so on the nose. Similarly in Victoria, where Julia Gillard brought in 55 percent of the vote at the last election. Do you really think this state will support Labor as enthusiastically now Gillard’s gone? A very small swing will deliver another three seats to the coalition here. All five seats in Tassie are Labor (or left-independent in Andrew Wilkie’s case) and the Libs can confidently expect to pick up one, probably two seats here. As we tour around the country it becomes obvious that the government’s struggling desperately to hold on – never mind adding to the tally. So what about Queensland? This state normally has the biggest swing, one way or another. Last time round it kicked Labor hard – possibly angry because the southerners had dispatched ‘their’ PM. Now Rudd’s back and the myth is that up to ten seats are in play, more than enough to match the losses elsewhere. The problem for Labor is that requires a swing towards it of five percent and that’s just not on the cards. For a start, the coalition members here will be insulated by the “sophomore effect”. This reflects the fact that people tend to give politicians the benefit of the doubt the first time they come up for re-election. That will be the case for the coalition’s Queenslanders. But the key to the result will probably be the overall election dynamic. This will emerge before too long. Labor’s promise of a “new way” strains credulity. It’s significant of a deeper malaise: the party’s effectively admitting it has no record to stand on, despite spending the last six years in government. Don’t forget another group of voters; those disgusted by the way Rudd’s abandoned all the policies he once stood for. His current whirlwind of promises has involved trashing those of 2007. Reducing greenhouse gas production? Scratch that, people don’t like it. Caring for asylum seekers? Ditto, or Labor will loose votes in Sydney’s west. Future agenda? Talk about productivity, short on the specifics. These are nothing more than opportunistic slogans seemingly demonstrating Rudd will say anything to get re-elected. Some people will ask themselves how it’s possible to give Labor any preference whatsoever. Many will vote informal. After all, when there’s no difference between Labor and Liberal why bother voting at all? Evidence of accomplishment is thin on the ground. Rudd’s central problem is the disparity between the noble words and pure emotions they conjure up, and the reality of his record. He seems to imagine the connection between ‘announcables’ – his spoken intentions – and their achievement has been firmly demonstrated. It hasn’t. Rather the opposite. And this is the key to understanding why an increasing percentage of Labor voters are likely to vote informal. It will be their way of registering disgust at the lack of choice they’re been given. 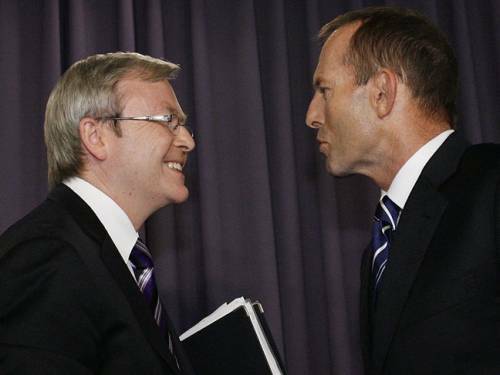 Politically, Rudd’s standing so close to Tony Abbott that it’s difficult to see the difference. When a mood begins to take hold it can flare up like wildfire and it won’t be pretty. A final factor needs to be accounted for. Rudd isn’t good under pressure. He doesn’t like being put on the spot and forced to answer questions. Remember how angry he became at the end of his previous period as PM, when interviewers began putting him on the spot. He quickly turns snarky. It remains to be seen if he’ll be able to cope with the pressure when he’s not in control of the agenda. It’s obvious he’s on the way out. But this time Australia, rather than just his colleagues, will be dispatching him. Nicster is back. Good for you that the Ruddster is back as PM - more for you to comment on and the Beattster is now a candidate in Qld. Can't keep a good Pete down. Fast moving pace here. Agreed! So fast - and yet so little happening . . .